The capture and sacking of Constantinople in 1204 by the Fourth Crusade, the Byzantine Empire split and went into a downward spiral. Although the Empire of Nicea (one of the fragments of the Byzantine Empire) regained Constantinople in 1261, the empire never truly recovered in any sense of the meaning. Nonetheless, it is impressive that it lingered on for almost two hundred and fifty years. Much of this is due to the military policies that the Byzantines carried out despite their reduced circumstances. Organized into seven chapters along with an introduction and conclusion, Savvas Kyriakidis’ book examines the Byzantine military and its conduct of war from every imaginable angle, combining excellent use of primary sources with sharp analysis. Kyriakidis approaches his topic thematically so those who are unfamiliar with Byzantine history may have some trouble with the constant jumping around, but this is a more effective method of study rather than a more direct narrative in which the themes often become lost. Furthermore, Kyriakidis is able to build upon and refer back to his previous themes in the later chapters, thus unifying the book in a comprehensible manner. In the first chapter, Kyriakidis examines Warfare and Imperial Propaganda. 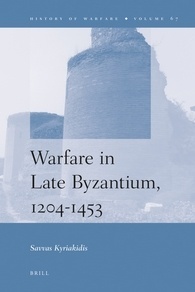 In this, he reveals that the Byzantines realized that warfare, while not always desirable, was inevitable. He also recognizes that the ideology of warfare changes after the recapture of Constantinople and also with subtle, yet important changes, between emperors. Additional changes in propaganda occured depending on the enemy: ‘impious barbarians’ or natural enemies. The so-called impious barbarians were the Ottomans with Serbians and Bulgarians as natural enemies. Kyriakidis examines the commanders in Chapter Two. The Byzantine aristocrat was expected and sought a military career as fiscal and civil bureaucracies were beneath their standing. Kyriakidis also points out that many perks also came with the position in the army, thus also making it a lucrative venture. Commanders were expected to be heroic yet also sensible and well versed in the arts of war, particularly strategy as evinced in the numerous books on the art of war produced by the Byzantines, such as Maurikos’ Strageikon. Of particular interest in this chapter, as well as other chapters, is Kyriakidis’ efforts to trace outside influences on the Byzantine martial philosophy, such as Western European ideals and practices. Between contact with Crusader kingdoms, wars with would-be Crusaders, as well as the use of mercenaries, the Byzantines had numerous contact with them. It is not surprising that some exchanged occurred between them, but prior to this work, it has been often overlooked. In Chapter Three, Kyriakidis examines the various types of soldiers the commanders led. These included pronoia (land grants) holders, the Allagia who were pronoia holders stationed in the provinces, as well as the differences between the Nicean armies and the the later armies. In this chapter he looks only at actual Byzantine troops rather than auxiliaries and mercenaries. Understanding the structure and use of land grants and other means of compensation is key as so many of the Byzantine units were organized around method of compensation. Over time, however, mercenaries, the topic of Chapter Four, became increasingly important to the Byzantines especially as their land assets dwindled, thus preventing the creation of new pronoia based troops. This is one of the most interesting chapters as examines the use of mercenaries not only as additional troops, but also some of the complications of being dependent on them. Many of the concerns remain valid in the modern world as well. Kyriakidis also considers the various types of mercenaries from the Catalan Company to Cuman or Kipchak horse-archers. Indeed, the later comprised a considerable portion of the Byzantine army in the late thirteenth century as a result of their displacement by the Mongols in the 1240s. While most mercenaries were paid in cash, the Byzantines sometimes paid with land and cash. In these instances, it was to keep them for the long term and often after they had proved their worthiness for long-term consideration. In essence, a mercenary could earn tenure. Due the complexity of the issues involving mercenaries, including Byzantine attitudes and problems resulting from them, this is also the longest chapter in the book. Chapter Five considers the campaigns. The image that we often have of the Byzantines in the later period is one of passively defending a dwindling empire. Kyriakidis debunks this with his careful analysis of campaigns not only in Anatolia but also in Europe. It is quite clear that in the fifteen century, the Byzantines were still able to mount the occasional campaign. In addition to providing a narrative history, this chapter also considers the logistics of those campaigns. Although the Byzantines did carry out offensive actions, our image of a passive empire defending its territory is not completely off base. Chapter six examines the use of fortifications for defense as well as sieges of enemy fortifications. Initially, the building of fortifications has been the prerogative and duty of the emperor, but as time goes by, it increasing shifts to private individuals. Often the fortifications cease being grand structures, but isolated towers. Nonetheless, on occasion an emperor appeared with a particular vigor for building fortifications. Unfortunately by the fifteenth century, cannons became increasingly important for siege warfare. Despite their best efforts, the Byzantines seem to have possessed either a reluctance to adapt gunpowder weapons, or an lack of understanding of how they were produced and used effectively. Chapter Seven discusses Tactics. While interesting, this chapter has some issues. The major tactic of the Byzantines was to study the enemy and use the appropriate force against them. He mentions against western style heavy cavalry, the Byzantines usually used a force comprised mainly of horse archers. This usually worked quite well, although the Byzantines always needed to maintain their own heavy cavalry in case they faced a particularly well disciplined enemy. Against the Turks, however, Kyriakidis mentions that the Byzantines used heavy cavalry, which seems to be counterintuitive. Perhaps, the Byzantines figured they knew the tactics and strategems of the Turks well enough that they could have success with heavy cavalry. This is the one section in the book that author is not lucid in his analysis and provides only a vague sketch of what he means. Overall, the chapter is quite useful though with useful analysis throughout it. Overall, Warfare in Late Byzantium is an excellent study of warfare in the Byzantine Empire and well worth considering. Two maps are included and are very detailed. One might have wished for a couple of battle maps, or perhaps a more detailed one for Constantinople, although the latter is easily accessible on the internet. With the exception of one part in the chapter on tactics, the books suffers from no serious issues and fills a major lacuna in our understanding of medieval military history.